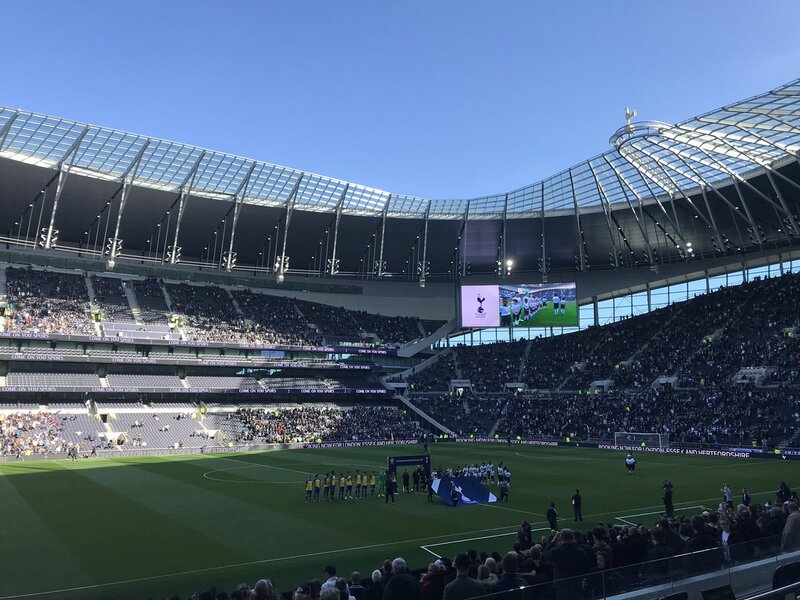 The new White Hart Lane finally opened over the international break. Expect Tottenham to play their next home game at the freshly minted ground. Spurs anticipated opening the ground midway through the 2017/18 season, then to open this campaign, then in January. Finally, the delays end and football begins. Tottenham are owners again rather than renters. Supporters will celebrate more than their new digs. The club avoided the transfer market in the last two windows, cost-conscious regarding the added expenses repeated setbacks incurred. Wembley Stadium doesn't come cheap. Critics warned that failing to sign players endangered the Lilywhites' continued Champions League status. The jury remains out on that forecast. Mauricio Pochettino's side lie third on 61 points but Arsenal, Manchester United and Chelsea all loom within four points with eight games remaining. Certainly, one or two signings might put them in the title race. Three losses and a draw dropped them 13 points behind Manchester City, 15 adrift Liverpool who've played an extra game. CEO Daniel Levy's transfer policy boggled the mind even before stadium financing entered the picture. Repeatedly, he sold world-class talents other chairmen would build sides around. Luka Modric. Gareth Bale. Kyle Walker. Okay, you wouldn't build a side around Kyle Walker but he definitely increases your chances to win silverware. Similar stars never came through the door at the old White Hart Lane, only promising talents who developed [Christian Eriksen, Dele Alli, Harry Kane, Toby Aldeweireld, Moussa Sissoko] and serviceable, inexpensive veterans to fill roles as needed [Lucas Moura, Fernando Llorente]. When sure things did arrive, Levy purchased them at affordable rates. Jan Vertonghen and Hugo Lloris arrived in 2012 for just over £28 million combined. Pounds invested and trophies won remain the two measuring sticks for a club's size and status. Levy doesn't spend and isn't bothered about winning trophies. Even so, Spurs went from a top-ten club that could never crack the top four to perennial Champions League participants on his watch. Everyone seems to think he's living on borrowed time but his squads continue to improve. Fans recently expressed outrage when Mauricio Pochettino suggested it could take a decade for Tottenham to win their first trophy under his management and Levy's stewardship. He was probably expressing the club's business outlook. More than £ 600 million in debt must be serviced on the new ground just as Arsenal did under Arsene Wenger. Player investment won't increase significantly. Spurs' fortunes, financial and competitive, rest on developing talent. Kyle Walker's sale allowed Kieran Trippier to grow into a Premier League and England star. It also afforded playing time for Kyle Walker-Peters. Harry Winks and Oliver Skipp also push for minutes. Christian Eriksen, rather than Harry Kane, might be the next big name to raise funds. At the back, Juan Foyth and Davison Sanchez appear ready to step in for the Belgian brothers, Aldeweireld and Vertonghen. Levy's machine churns. With a 62,000-seat capacity, the new ground lies second in the Premier League attendance table behind Old Trafford. It will increase revenue but Spurs' ownership doesn't have money to burn like Manchester City's Sheikh Mansour and Liverpool, United and Arsenal's American billionaires. Poch's ten years wasn't a joke. Tottenham isn't going to break the bank to win. They're building a home so comfortable that when success arrives, it won't want to leave. 29-year-old freelance writer, writing about football is what i enjoy doing, I love Manchester United.